Home » The most Cost-Effective Method of Build Two Storey Homes in Perth! 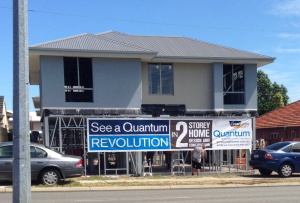 The most Cost-Effective Method of Build Two Storey Homes in Perth! Great Living Homes are the two storey homes specialists located in Mandurah and building throughout the Bunbury to Yanchep region (including the Perth metro area and surrounding suburbs) in Western Australia. We also build single storey homes, granny flats, apartment complexes and custom homes, but we are 2 storey specialists because of the new construction method we have developed which allows for shorter construction times and more competitive prices. Our unique method of construction involves building the upper floor first on ground level before we lift it up to continue building underneath. Our company director has developed his own technology to allow us to lift the top storey into place safely and securely and ultimately the process can cut weeks off your standard double storey build time. While the act of lifting an existing home onto stilts is nothing new (especially in Queensland where this is quite common as a method of flood-proofing homes), Great Living Homes are the only two storey home builders using this method to construct 2 storey homes in Australia and possibly world-wide. The process of lifting and stumping existing homes has always been a time-consuming one, due to the tools and methods used lifting a house can take several days or more to organise and complete, not to mention the plethora of manual labour required. The technology used by Great Living Homes can see an upper floor lift prepared and lifted in just one day with everything going according to plan. The result is less money spent on manual labour, less time wasted, less expensive equipment being used and ultimately these savings are passed onto our clients! With over 25 years of experience building two storey homes in Perth, endless custom design options and numerous standard two storey home plans available all topped off with excellent customer service, why wouldn’t you visit Great Living Homes to find out more? Which is Best for Your Home, Steel or Timber Frames?